This little project is a marriage of my love of blackwork and my love of samplers. Anyone who has been following The Shop Sampler blog will know that I have been playing with samplers and stitch practice for this year through the Take a Stitch Tuesday challenge at PIn Tangle and with the support of the Stitchin’ Fingers community. I have also joined the Yahoo group The Sampler Life. (As if I didn’t already have enough internet reading to do!) It is also a good group that is supportive and very creative as well as opening up even more of the international stitching world. I mentioned in my last post that I am an avid fan of the Antique Pattern Library and have joined that Yahoo group, too. It’s the best way to keep up with what’s new at the Library. Also an international community of stitchers, I’m expecting that anyone needing help with translations can find someone there. I have struggled with what thread I want to use for my Mystery Sampler project. I’ve looked at and bought a sample of every black thread out there. I have read about different people’s preferences. I have been playing with different (colored) threads in my TAST projects and it is very clear how certain threads work for one desired effect and some threads will not work in the same situation. Like twisted thread works well for Double Twisted Chain, but stranded thread just looks messy in that stitch. Samplers are the tried and true method of testing patterns! Hence birth of a new sampler! Oh boy! You would think you could just pick up your fabric and start stitching. WRONG! Well, maybe a little right. But I want this sampler to be useful, to be a really good reference, like the Encyclopedia Britannica of blackwork thread usage. 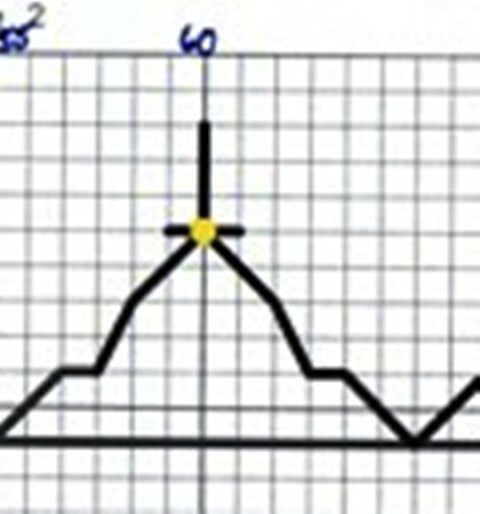 Or Wikipedia entry of blackwork thread usage for those of you who are younger than Baby Boomers! So what features should be incorporated into this sampler for it to be eternally useful? 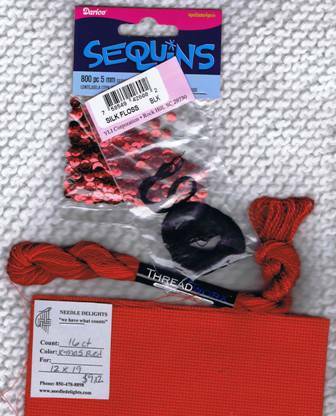 The threads should be identified clearly in the sample or there should be a legend that will never be separated from the sampler. The threads should be used as fully as they would in any worked piece. In other words, if the thread is a stranded one, then strand usage should be incorporated to the piece. The sampler should answer any question a person might have about the thread as used in any type of work. The threads sampler should show very clearly the differences between the various thread samples. I have answered some of these questions, in fact many of them at thigs point. But before I tell you what I have figured out, I want to hear from you. How would you answer these questions? What other questions do you think would be important? You tell me then I’ll tell you. Deal?! I’ll give y’all a couple days to mull this over before I post again! I was torn about what to post today. It’s a nice feeling to have ideas flowing. Someone said the other day they would love to learn how to do this. I almost decided to post on a basic lesson, but I think I will save that for the next post. I did say I would show you the lovely red silk I found to use in this sampler. And here it is. It is from ThreadWorx, Vineyard Silk number V140. Not too clear in the photo is a packet of YLI black silk floss. The red sequins are 5 mm and are a Darice product. The red fabric I’ll be using is a 16 ct evenweave. Not shown in the photo are the black 11° seed beads I plan to secure the sequins with. I may use another black fiber. Not sure yet–I’ll play with that as I go along with the project. It would be just as easy to use more than one strand of the YLI silk. We’ll see. Are you planning to work this sampler with me? What materials do you plan to use? It’s been too long! Jeff and I made it to Mississippi where he promptly had to undergo unplanned surgery, then six weeks plus of recuperation. Then the Holidays. But it’s a new year and with it comes fresh comittment. I declare this the Year of the Blog–for me anyway! I have four blogs. That’s too many. But each is important to me for different reasons so I can’t give any of them up. I will remain comitted to a post a day, but the posts will rotate between four blogs: The Shop Sampler, Relatively Ryan, Sight Sniffing, and, of course, Blackwork Lessons. 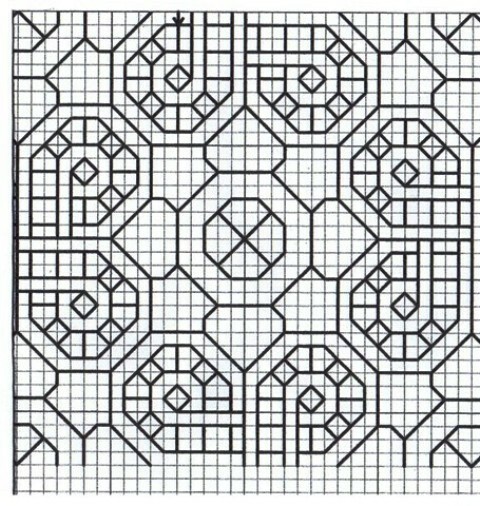 News on The Mystery Blackwork Sampler—I have picked patterns for the blackwork squares. I have tentatively picked out a needlepoint stitch for the inner border as well as some patterns for the needlepoint squares. I decided to add another color to the black silk. I’ll pull it out and share that with you Thursday when my daily post returns to Blackwork Lessons. Until then think about a second color you might add to your Mystery Blackwork Sampler. Write and tell me what color background you are using and what your second color will be! Tomorrow I’ll be posting at The Shop Sampler. We are hitting the road tomorrow, heading south to Mississippi. I’m planning on keeping my eyes open to see if I can find any motifs in our travels that would translate well to a blackwork design. I have also uploaded all the files I have gathered from the internet about Islamic Architecture and Art as well as quasicrystalline geometry, the foundations of Spanish Work or blackwork. So there is much reading I can be catching up on while we are on the road and don’t have access to unlimited electric power. Luckily, I can recharge my reader from the car battery. When we stop and have a connection, I’ll post what I have learned in my travels. BTW, today I found some nice red spangles to use on my Blackwork Mystery Sampler. I was thinking, too, that if I can’t get the red congress cloth, I could do a basketweave in red on a plan 18 ct mesh canvas, then do the blackwork stitching over that. We’ll see. 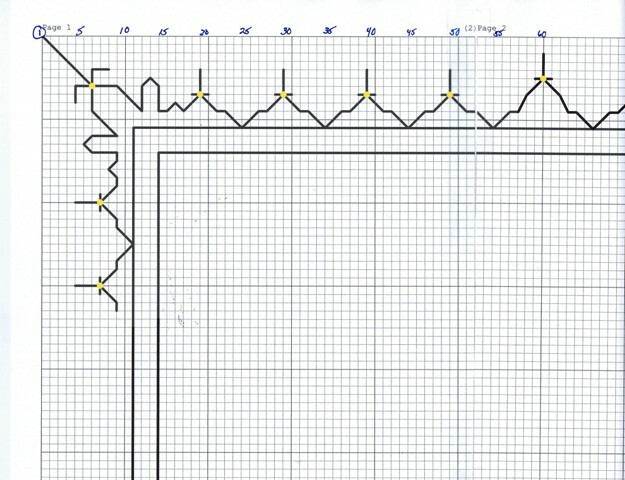 Would love to hear what you think about the outside border and if you are planning on stitching along with me!